Rachel Swetz, VMD, was born and raised in Chicago, Illinois, and received her undergraduate degree in English from the University of Chicago. After college, she lived in Chicago and New York City for several years before realizing that her true calling was veterinary medicine. She received her Veterinary Medical Degree from the University of Pennsylvania School of Veterinary Medicine in 2006. 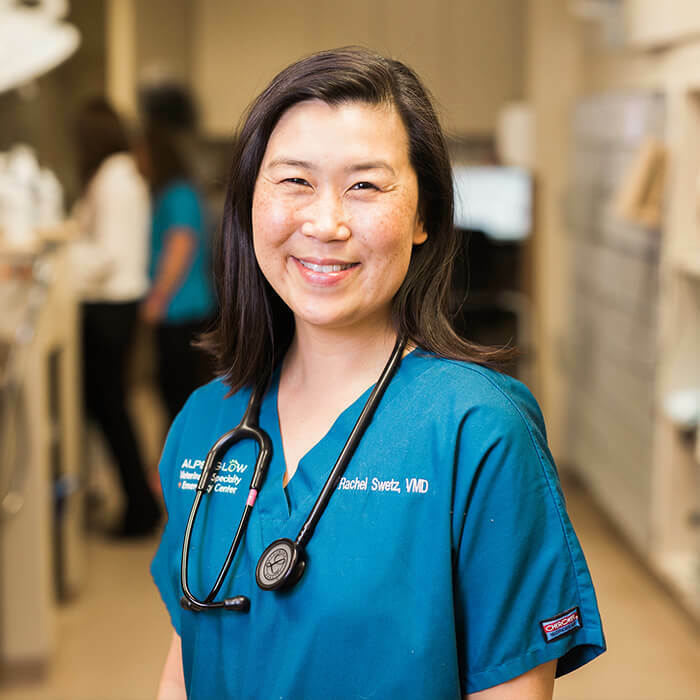 Before joining the 24/7 emergency staff at Aspen Meadow Veterinary Specialists in Boulder, Dr. Swetz worked at a general practice and emergency center in Pennsylvania, where she developed her interest in emergency medicine and critical care. Dr. Swetz lives with her husband, their young son and daughter, and two dogs – Ralph, a pit bull, and Bernard, the sweetest mixed breed in the world.